Overseas shipment can be challenging when transporting expensive objects. 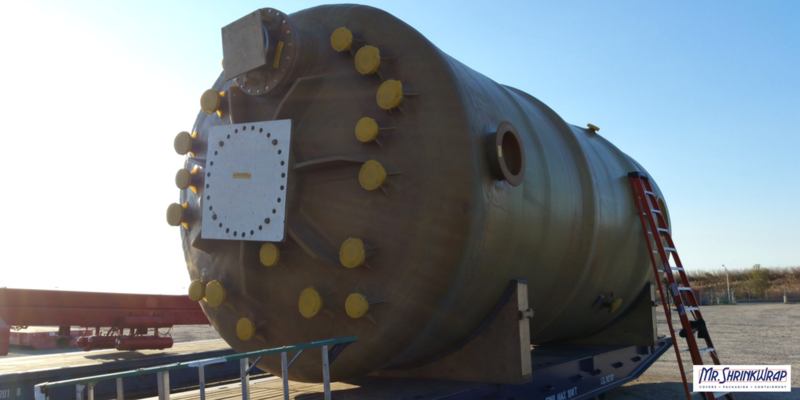 We wrapped the tank in our 10 mil film, which is made of resilient 100% virgin resin with 12-month UVI protection. 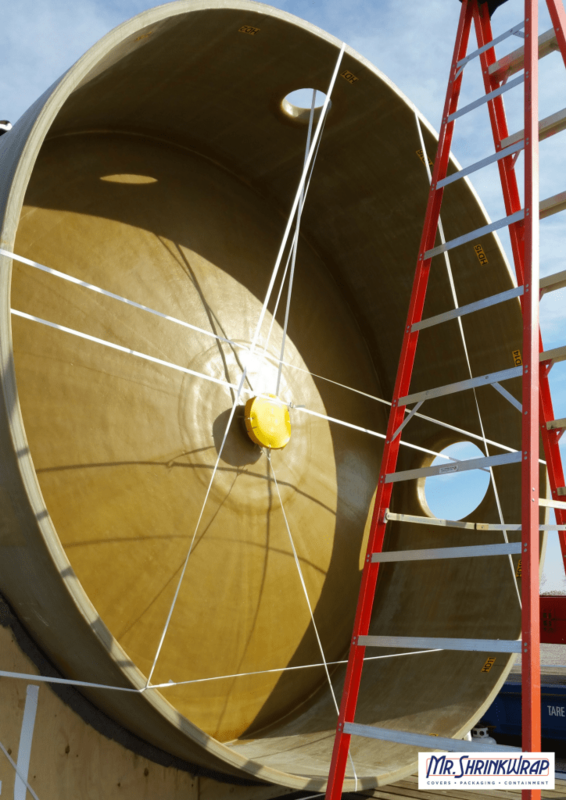 The tank, around 11 feet tall, was protected with a 5-sided wrap with a perimeter strap positioned as low as possible. Below the center of the tank, we pinched the perimeter strap closer together using two belly-bands. This provided the tightest and lowest wrap possible. Even in the severe wind conditions which we were wrapping in, we were able to get a very protected, tight wrap for the tank, which definitely makes this an #awesomeinstall! The key to our wrapping service is in our experience of understanding the protection requirements of our customers and the capabilities and intricacies of installing industrial heat shrink wrap. Once the variables of size, duration, mobility and accessibility are understood, our personnel are able to recommend the proper application method to meet those requirements. 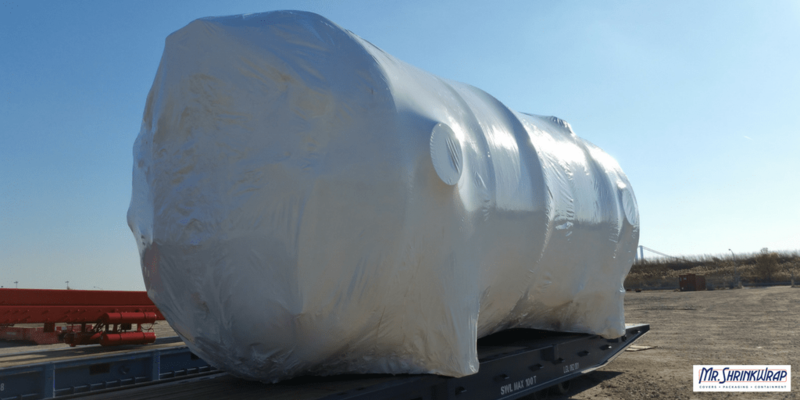 When properly applied by our skilled personnel, our high quality industrial shrink wrap provides a remarkable protective cover around an object. Do you have something that needs to be protected for shipment? 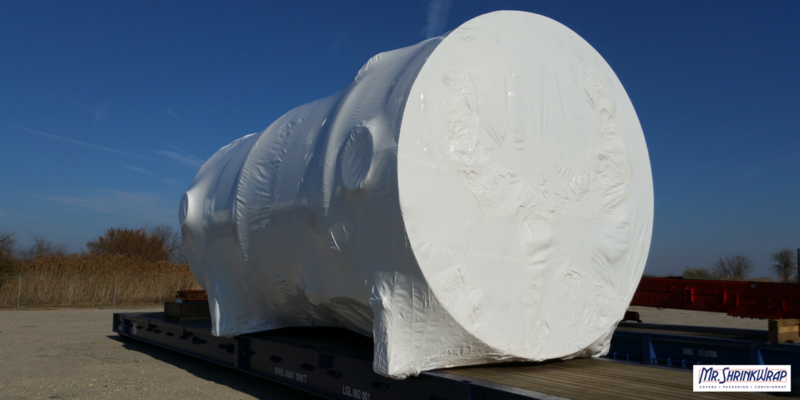 Getting a quote for commercial shrink wrap services is easy with Mr. Shrinkwrap. Using our online quote form, let us know the dimensions of the object that you would like to wrap and we will quote a price inclusive of any travel expenses to your location. We welcome pictures, drawings, sketches and descriptions of the object that you would like us to quote wrapping. You can also call us with questions anytime at 1-888-366-0617 or chat with us at mrshrinkwrap.com. Mr. Shrinkwrap (www.mrshrinkwrap.com) is a global provider of on-site shrink wrap services and distributor of shrink film, heat guns, shrink wrap tape, preservation tape, stretch wrap, self-adhering films, and shrink wrap supplies. Mr. Shrinkwrap provides a variety of commercial, industrial and residential shrink wrap applications. Since 1991, Mr. Shrinkwrap has evolved from a local boat covering service to a thriving business with international scope. Mr. Shrinkwrap has been asked to provide shrink wrap services for objects ranging from outdoor furniture to nuclear power turbines.